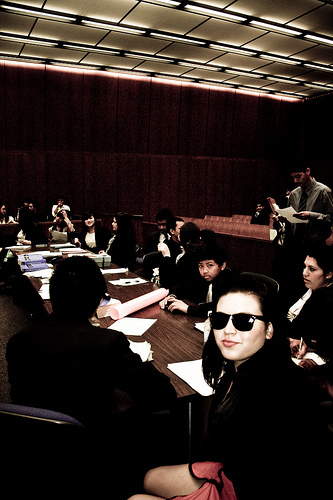 Many jurisdictions around the country have teen courts. These are voluntary, alternative programs that keep the first-time offender out of juvenile court and from establishing a record. They are run by either the juvenile court, juvenile probation department or a school district. Teen Court is staffed by teenagers who are volunteers from the community. They act as the jury, prosecutor, defense attorney and bailiff. The judge is an adult volunteer and may be a local attorney or judge. States differ in the requirements of teen court but generally persons between 10 and 18 may appear before the court. It is voluntary and the person must be willing to admit what he or she is accused of doing. Teen courts only deal with low level misdemeanors such as shoplifting, traffic violations, alcohol and tobacco offenses, disorderly conduct and minor criminal damage. The teen jury is responsible for deciding the penalty. The teen prosecutor argues for a certain penalty while the teen defense attorney pushes for a lesser consequence. The jury discusses the case and arrives at a decision that is announced by the judge. Consequences usually include community service, education classes and an order to serve as a juror in teen court. Completion of all sentencing terms results in dismissal of the case. If the teenager fails to complete his or her sentence, the case may result in the filing of formal charges in juvenile court. My daughter has missed thirty four days of school. Can she be put on PINS or be arrested , charge with a crime, or be put in jail? Dear Laura: The answer to your question depends on the laws where you live and the rules at the school she attends. Take a look at the school’s Student Handbook and/or the Code of Conduct. You may be able to see these on the school’s website. As far as the truancy laws, google the name of your state and “compulsory attendance law” for information. You can also speak with the school’s attendance officer for information. Good luck. Hi, This is a question in regards to teen court. I was assigned random drug testing until July 14th, And was wondering is there any way to get off earlier than that because of how they send the random papers in the mail per month. I would like to go out of town and do not want to jeopardize anything with teen court. Dear Bri: Contact the court or your probation officer or whoever is supervising your program. Let them know about your plans to go out of town so that you can be sure to comply with all of your terms and not miss one of your random drug tests. They most likely will be able to work around your vacation plans. Good luck. Dear Hannah: It’s up to the court and the law where you live whether “diversion” is available for this offense. There’s a good chance it is since this is your first offense. You’ll find out more when you go to court. Good luck. Dear Joseph: It is possible that the incident on your record. It depends on how it was handled at the time of the offense. Contact the court and ask about this. Or your probation officer if you had one. If a record does exist, ask about applying to have it cleared. Good luck. Hi, this question isn’t completely related but i’m not sure where else to ask. If i’m 18 and If i am charged with a first time offense of vandalism how much will the fine be? If I plead guilty will it go on my record? Dear E: The fine may depend on the amount of damage done and cost to repair the damage. There may also be an additional fee to pay depending on your state laws regarding vandalism. When you go to court for this, ask about the consequences if you admit the charge. If you plead not guilty and go to trial, the judge will decide the penalty if you’re found guilty. As far as your record, again it depends on the laws in your area. If you complete a diversion program for this, you won’t have a record. Otherwise, after a period of time, you can apply to the court to have your record expunged. Ask about this at court. Good luck.